IT services providers in Los Angeles today incorporate a crucial service known as cloud computing. To describe it in simple terms, cloud computing is the storage and access to programs and data through the internet instead of accessing it from the hard drives. Cloud services are provided by companies called cloud providers. So the word cloud is simply a word that refers to the internet. If you are accessing your data via the internet, then it means you are using cloud computing. Whenever you search for something on Google, your computer does not do the searching. The search is done from another machine probably sitting somewhere far away. Your computer only acts as a medium for receiving the results. The web-based email is an application that allows you to send and receive emails from any device via the internet. A new version of cloud computing is the one that allows you to create documents over the internet. A good example is the Google Documents. You do not have to sit on one specific computer to complete your task because you can access your files over the internet. Cost Efficiency – With cloud computing, you get to do away with all the costs associated with purchasing and installing software and hardware and managing the onsite data centers. Speed – Cloud computing services are self-services given on demand. All you need is a few clicks and within minutes, you have what you need. This makes businesses operate with flexibility without the pressure of capacity planning. Global Scale – With cloud computing, you can scale elastically. You only get the IT resources that you need. If you want more or less computing power, you get exactly that. Everything from bandwidth to storage is given immediately when needed. Backup and Recovery – One of the most fundamental IT services in Los Angeles is data backup and recovery. Cloud computing allows storing data in the cloud. It is easy to back up and restore data that is saved in the cloud. In addition, cloud providers have the expertise in handling data backup and recovery. This is what all companies need for business continuity. Automatic Updates – The best part about cloud computing is that the servers are on off-site premises. Your supplier takes care of everything on your behalf. This includes any needed security updates. Now you have the time to concentrate on your core business. Work Flexibility – Once you adopt cloud computing, you can literally access your files and work from anywhere provided you have internet. Environment-friendly – Moving to the cloud leaves something for the environment too. You can scale up and down and utilize the energy that you need without leaving those oversized carbon footprints. 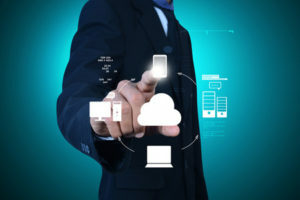 If you have not switched to cloud computing, it is now the time to do so to realize the full potential of your business. Intelecis is an IT services provider in Los Angeles that provides cloud computing and many other IT services. Contact us now to know how we can help you scale up your business through cloud computing.